The Civil War, or War Between the States, was arguably one of the darkest periods in American history. Over seven hundred thousand lives were lost in the conflict that pitted father against son, brother against brother. If this was such a horrific event, then why study it? For some teachers, it's a part of their assigned curriculum, but textbooks rarely do justice to the personal perspectives of those who lived through this harrowing time. 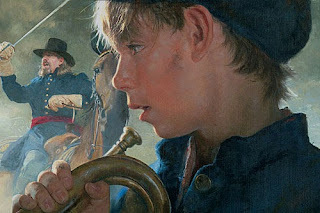 For other teachers, a common background knowledge of the Civil War is crucial to reading and comprehending Civil War era historical fiction novels such as Charlie Skeddadle , Rifles for Watie , Bull Run , and Soldier's Heart . 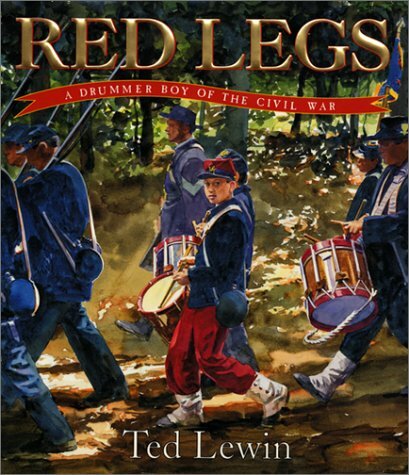 Even the reader of the tongue-in-cheek misadventures described in the recent Newbery Honor winning The Mostly True Adventures Of Homer P. Figg can benefit from a basic knowledge of Civil War history. 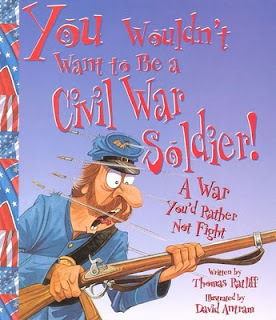 Apart from these pragmatic reasons, though, why should we care about Civil War picture books? First, because the Civil War was the ultimate test of our young country's ability to stand united. Second, because the Civil War is as much a study in human rights as it is in states' rights. And third, because an understanding and appreciation of our existing rights comes only through an examination of the bloody conflict which guaranteed those same freedoms to all citizens. 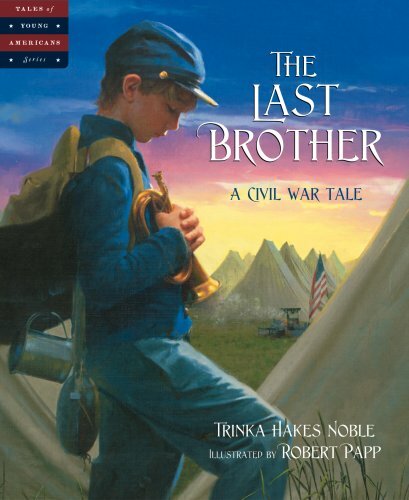 The Last Brother by Trinka Hakes Noble serves as an excellent introduction to the external and internal conflicts of the Civil War. (You may recall an earlier post on The American Revolution where I praised Noble's The Scarlet Stockings Spy ). In this tale, a young bugler is forced to choose between duty to country and loyalty to a friend; in the end, he is able to honor both. 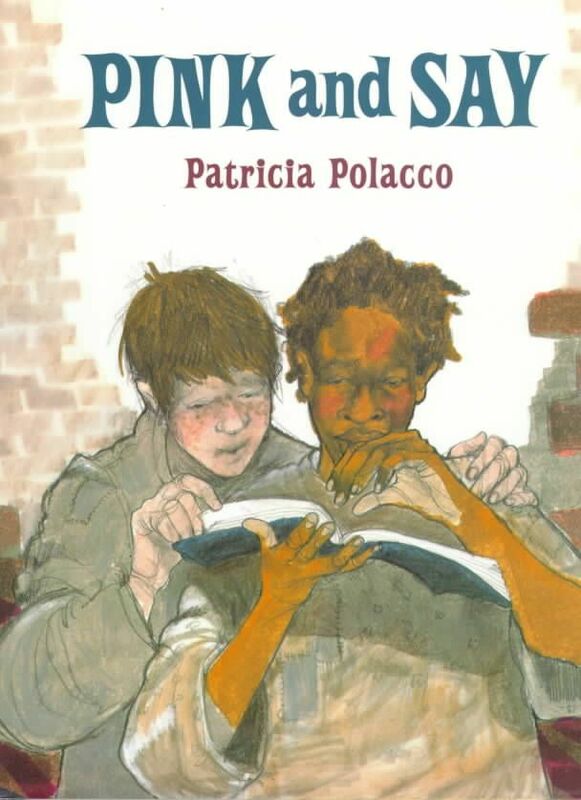 Like The Scarlet Stockings Spy, this book is incredibly well researched, using exacting vocabulary within a context that allows young readers to construct meaning, as well as a sense of time and place, without losing the narrative flow. At the same time, it delivers a compelling story that serves a snapshot of the torn allegiances suffered throughout the entire nation at this time. The Last Brother was written with deep respect and honor, not only for my ancestors, but for all who served in the Civil War. Robert Papp's realistic paintings dramatically frame each page, providing additional impact to the already emotional tale, while showing equal attention to historical detail and accuracy. 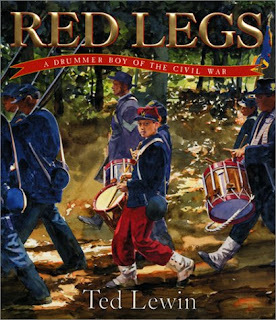 Ted Lewin's Red Legs tells the story of nine year-old Stephen's first foray into battle. 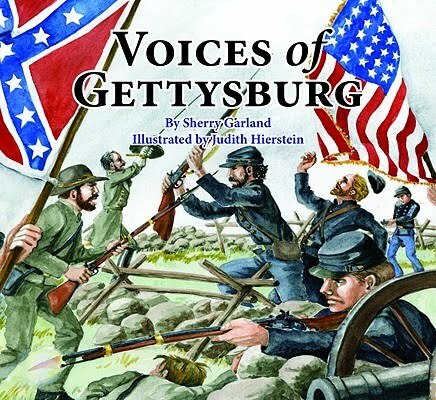 The text provides just the right amount of information for young readers, who at book's end discover that Stephen and his soldier father are actually Civil War reenactors, or living historians. "Reenactors do it," explains Lewin, "because they love history and wish to honor the memory of the men and boys on both sides who died so long ago." The book's endnotes explain that the drummer boy is based on the life of Stephen Benjamin Bartow, a Civil War musician from Brooklyn's 14th Regiment, who not only survived the war, but went on to become a mason who helped to build the Brooklyn Bridge. The large format of this book as well as Lewin's bright and detailed paintings make this an excellent foray into the topic. (Check out a study guide for Red Legs provided by the Brooklyn Public Library). 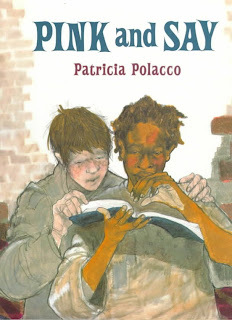 Pink and Say is Patricia Polacco's true-life tale of two Union soldiers, one white and one black, who are caught behind enemy lines. Finding Say wounded on the battlefield, Pink transports him to the abandoned plantation where Pink's family was once enslaved. While there, the boys compare their experiences as soldiers fighting for the same cause. When Confederate marauders invade the house and kill Moe Moe Bay (Pink's mother), the two boys are forced to flee North. The bittersweet ending to this book (I won't give it away) delivers an emotional punch when we discover the author's relationship to one of the book's protagonists. If you want to put a personal face on the tragedies of war, get your hands on this book. Voices of Gettysburg , like Pink and Say, provides personal perspectives of the conflict. In this case, however, we hear the words of several participants, including General Robert E. Lee, Rachel Cormany (a housewife of Chambersburg, Pennsylvania), General George Meade, and Colonel Joshua Chamberlain (once a college professor but now commnader of the Twentieth Maine Infantry). These and other voices describe for us the anxiety, anger, and anguish surrounding one of the most pivotal battles of the war. If you're asking students to create mock journal entries, then author Sherry Garland has provided some excellent models for you to share. In 1863, General Lee took the fighting to the North, leading his troops into Pennsylvania. Lincoln mobilized thousand of Union troops to intercept the Rebels. In The Battle of Gettysburg: Would You Lead the Fight? an engaging "you are there" format challenges readers to continually choose between courses of action, given the particulars of an historic situation. Each of the situations is, indeed, taken from history, and succeeding pages reveal the actual courses of action taken by generals and presidents, and the consequences of those actions. This is the perfect book for students who want to feel that they're a part of history! Photographs, paintings, and battlefield maps round out the easy-to-read text. 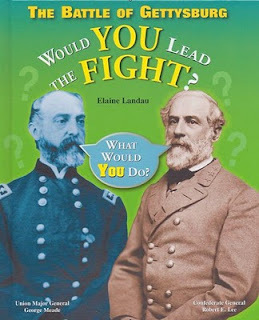 (Be sure to check out one of the other related titles in this series from Enslow Publishers: Would You Do What Lincoln Did? ). 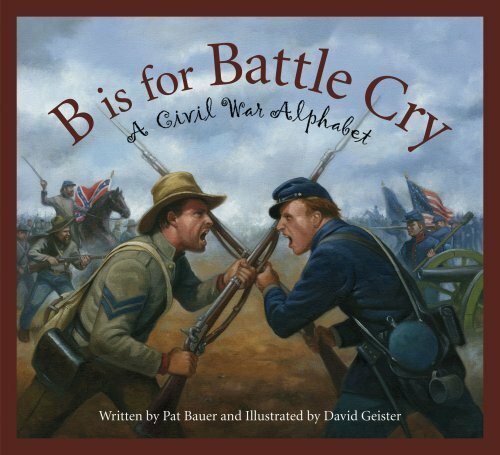 B is for Battle Cry: A Civil War Alphabet provides a fascinating look at all things Civil War, literally from A (Abraham Lincoln) to Z (Zouave, a brightly dressed soldier whose garb was inspired by African units fighting with the French in North Africa in the 1830s). Each page features a fantastic painting by illustrator David Geister, and poetry and prose by author Patricia Bauer. Students can read as far as they want on each page, as the text "drills down" to more specific topics. The page on Trains, for example, not only discusses their impact on the war, but also points out other innovations (submarines, rifled cannons, photography) which made the Civil War one of the first truly modern wars. If you're looking for a book that reads like a narrative, but acts as a reference, this should be on your classroom shelf. You Wouldn't Want to Be a Civil War Soldier is from the "You Wouldn't Want to..." series of nonfiction books created by British author David Salariya. The series has since been taken on by several other writers, although the extremely talented David Antram continues to illustrate most titles. In a previous post about Salariya, I mentioned that the Manchester Evening News called this series "a fascinating full-on colour weapon in the battle to get kids to remember historical facts." This title continues in that tradition, sharing facts about army life that are rarely remembered today. The typical lot of the foot soldier on either side was boredom, filth, and hunger, only occasionally punctuated by horrific and bloody battles. This book begs the question, "So why did they do it?" and then answers that question. Again, a great resource for fictional eyewitness accounts, and one of those books that will be read at will in the classroom, especially by your boys. 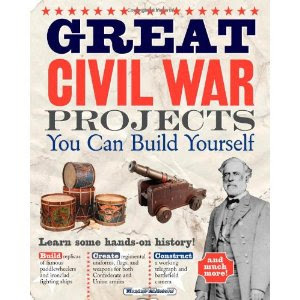 For hands-on projects in the classroom, I can recommend no book more highly than Maxine Anderson's Great Civil War Projects You Can Build Yourself . First, this book comes from a long line of excellent resource books for teachers and students from Nomad Press (read a rave about them in an earlier post). Second, the book itself is an incredible source of information about the innovations and technology of the war. You could easily make those topics alone the focus of a related Science unit, and this book would yield enough activities for at least an entire marking period. Ample background about the war and the people who fought it would, in fact, make this an excellent stand-alone "textbook" for any classroom, grades four and up. Third, the activities are easily "doable," and actually pretty cool! I can't say the same for some other hands-on books that I skimmed and quickly dismissed. Few of the projects here require special materials, and most could be made by students with little assistance. Imagine creating a battlefield camera and a telegraph that actually work! (Check out a free resource from this book at their site). Harpers Weekly was the primary contemporary source of news about the Civil War. Now you can see all of its archived issues in one place! At Sons of the South you can view the paper by week and year, or study specific battles. To use the Harpers Weekly resource in class, team students up to research the main facts of a single battle, and then summarize those facts into three to four paragraphs. 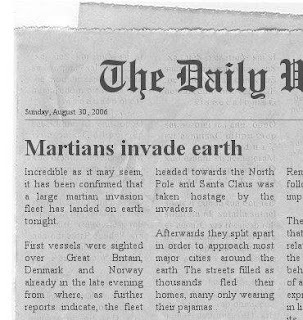 Using the The Newspaper Clip Generator (pictured) allows students to create a fictitious newspaper article with a realistic look, while at the same time limiting them in both space and word count. This forces them to tell only the most important facts. The Brooklyn Public Library provides a number of lesson plans and resources about the Civil War, with special focus on Women, Slavery, Soldiers and Daily Life. 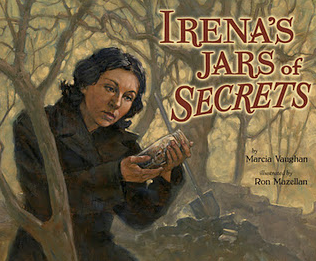 The downloadable lesson plans take advantage of the interactive resources offered at the site, as well as easily attained picture books, like Ted Lewin's Red Legs , Anne Rockwell's Only Passing Through: The Story of Sojourner Truth , and Shana Corey's You Forgot Your Skirt, Amelia Bloomer! Also available there, an easy to understand glossary which would be the perfect supplement to any Civil War unit. 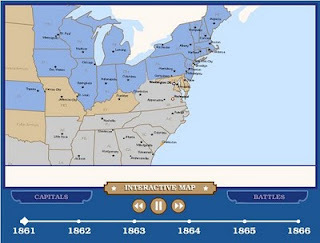 If you're looking for more interactive-type reviews, check out Mr. Nussbaum's Civil War activities. There you'll find cloze passages, self-checking reading comprehension selections, time lines, word searches, and more. Along that same line, you'll find several self-checking quizzes, reading resources, and lots of links at Mountain City Elementary's Civil War page. It looks old-school Internet, but I promise you, take the time to look around and you won't be disappointed! Explore the links to discover lots of reading and history integrated projects which are easily adaptable to your classroom. 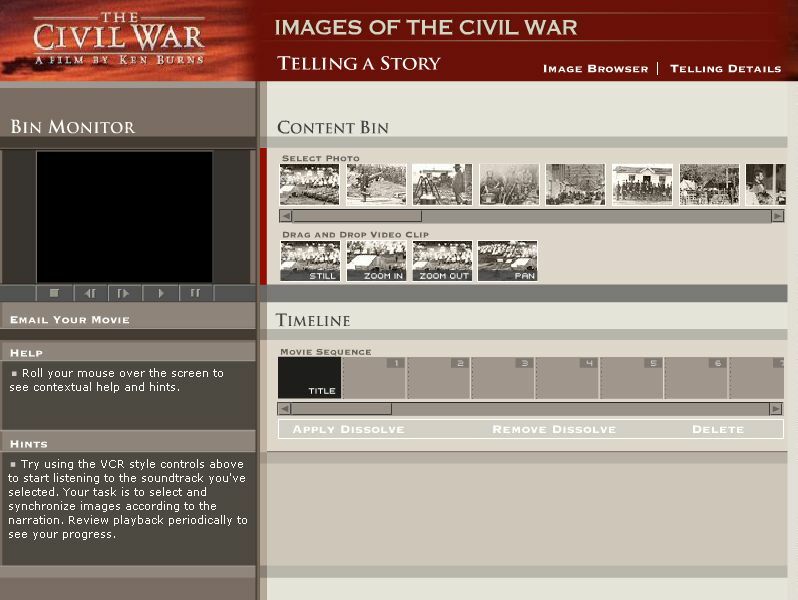 The PBS companion site to The Civil War, a film by Ken Burns, features not only the expected classroom activities, but also a pretty neat project involving digital storytelling. You might like what you see there, or that same idea could just as easily be executed using PhotoStory, Movie Maker, VoiceThread, Prezi, and even Power Point. Note that the movie below, along with filmed interviews, makes extensive use of period photographs to tell its story. Other resources at other sites include animated battle maps (such as this one of The Battle of Gettysburg), annotated time lines, student sites, short reading selections, and ready-to-go lesson plans created by teachers. If you can't find what you're looking for anywhere else, or if your students are researching specific topics of the war (such as music, poetry, money, stamps, etc. ), then try this comprehensive site from Dakota State University or this annotated outline from Great American History. I'd love to hear your ideas as well, or to learn about a book or site that I neglected to mention. Leave a comment below! Wow, you are really putting a lot of work into this site. I really enjoyed browsing through. Thanks for stopping by my site. I agree with Aimee--this is an excellent post. I received your email and will be answering soon, and I am so glad I stopped by and checked you out. Thanks for checking out my blog. :) I love using picture books with students of any age! Love this post! It will come in handy if I ever get a customer at the bookstore looking for history books that aren't texbook'y. Thanks for hoppin' by my blog this weekend! The Lincolnarchives Digital Project is the only website which is compiling all of the federal records created during the Lincoln Administration, including all Civil War records. These documents, housed in the National Archives and Records Administration are being scanned in color, and transcribed, providing access to the millions of records centered around Lincoln and the Civil War years. Not only are there primary source documents, but there are newspapers, political cartoons, maps, and photographs. An interactive timeline covers Lincoln's life. Video podcasts from leading Lincoln and Civil War scholars provide insight to special topics. Thanks all for stopping by, especially my fellow bloggers via Follow Friday. As you can see, I often write marathon posts, which explains why I don't post every single day! I enjoyed checking out your blogs as well. Karen: thanks for this information regarding the Lincolnarchives Digital Project. Talk about one tough term to be a president! The Project sounds like an incredible resource for teachers and students at all levels. Hi Keith, sorry to take so long to reply to your comment. Yes, Lincoln did have a tough time in a very tumultuous period in our history. 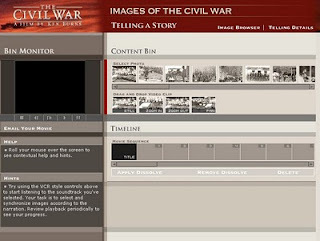 With the Civil War 150th anniversary now happening through 2015, I hope that this resource will help not only Americans, but those around the world with the interest of the American Civil War and Abraham Lincoln, to better understand why our country fought this war, and how it also molded our country into a United States of America. I'm a homeschool mom who loves to teach with picture books and other "real" books, and I love your blog. Thought you might like to know that I found this post when I did a google search for "Civil War picture books"; it came up third on the list. Thanks for that feedback, Loretta. Always interesting to see how people end up here. Glad to see that Google is giving my site a "nod." By the way, even though I'm a public school teacher, many of my relatives are homeschoolers. How I love your site! Teaching with picture books - awesome. I just looked through your archives and pulled out MANY titles to request for my 11 year old son and 8 year old daughter. THANK YOU! !